These homeowners had really cool old doors that were original to the home, but that didn't hide the mess in their mudroom. 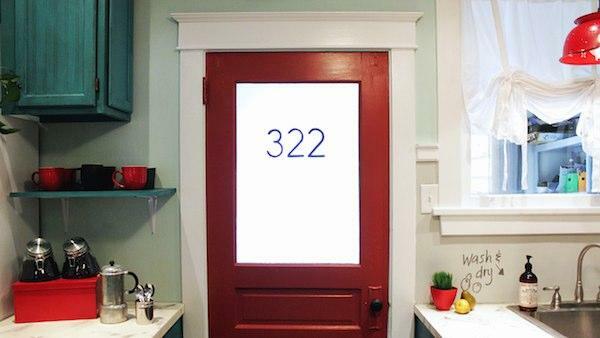 A frosted window and some cool numbers not only hides clutter, but adds style too! 1. Remove door from hinges and door knob from the door, and take outside onto a drop cloth. Paint the door your desired color, using paint plus primer. Let dry completely. 2. Tape off the glass (around the outside of the glass, since you're working on the window area now) with painters tape. Spray the glass with frost spray paint using nice even strokes about 6-8 inches away from the glass. You can vary the opacity of the color by the number of coats you do. Let dry. 3. Place your stencil (or in our case, house numbers) on the glass about 1/4 of the way down from the top of the glass and use a level to make sure it's straight. Tape in place. Using a small artist's brush, fill the open stenciled area with glass paint. Glass paint is very thin and may bleed, so use less paint than you normally would. If you don't have glass paint, craft paint would work as well. Remove the stencil and let dry. We instantly added some old country charm to this already cool door. Instead of being a decorating eyesore, we transformed it into a statement piece at the center of the room! Gotta love that.